"Traditions & Rituals" Traditions have for the most part remained the same over the last 100 years but couples have been personalizing some of the standard ones in recent years. 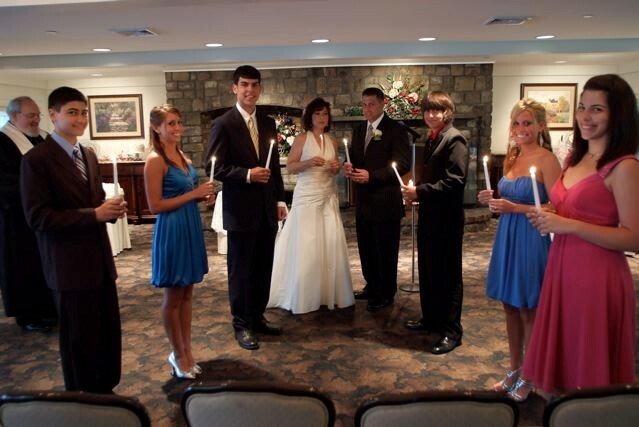 With more couples being married outside the church and in the great outdoors, the unity candle has become a challenge. We have heard ideas like drill out the center of the candles and insert the trick birthday candles so if blown out they will relight again and again. 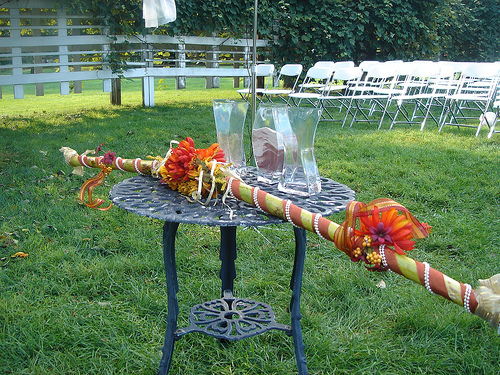 Also couples have moved on to sand ceremonies, unity bouquets even the mixing of wines. Here we see a sand ceremony coupled with their own tradition of jumping sugar cane. Both fami﻿l﻿ies are from sugar producing islands and sugar cane has always been a happy and positive entity in their lives. "Ask God" I read an article by Gary Sullivan called “MS as a Spiritual Journey” This was published in “inside MS” which is a quarterly magazine for members of the National MS Society. As I read it I could not help to think about the millions of dollars spent on law suits to remove prayer or a religious or spiritual icons be it permanent or seasonal. Or one’s that have been removed to avoid those law suits and the extreme cost involved. This article discusses the benefits of prayer and spiritually in those who have been diagnosed with MS. It states that in studies starting as early as the 1970’s have shown that spiritually and religion is a very important aspect of coping with the disease. And that people with a spiritual life feel as though there is a greater purpose and meaning to their disease and don’t see themselves as being totally disabled. Quoted “One person in that study could swallow and move his right finger that was just about it” and he described himself as “not very disabled” In 2001 The George Washington Institute for Spiritually and Health (G Wish) was formed with the goal of re-establishing a connection between spiritually and health in medicine. The Boston Home established 1881 for adults with physical disabilities Bridget M Haase, OSU states that “We make no distinction between emotional and physical pain and most residents hunger for spiritually” The article continues to quote and connect prayer and spiritually with wellness, longevity and a purpose on life. I quote from the article “In a May 2004 Gallup poll, 55% of Americans said that religion was “very important” in their lives; 29% said that it was “fairly important””. That’s 84 percent of Americans stating that religion was important in their lives. In 1997 ABC News poll takers reported that 95 percent of Americans said “they believe in God”. Just this past December, 86 percent said they believe in God and another 8 percent said they believe in some form of a universal spirit or higher power” With 95 percent of the nation believing in God why are the millions being spent trying to remove Him? We could be spending the millions on medical research. Maybe if 95 percent of the Americans were to ask God? WHERE TO START? CONTACT US FEEL FREE TO ASK QUESTIONS, WE ARE HERE TO ASSIST YOU.